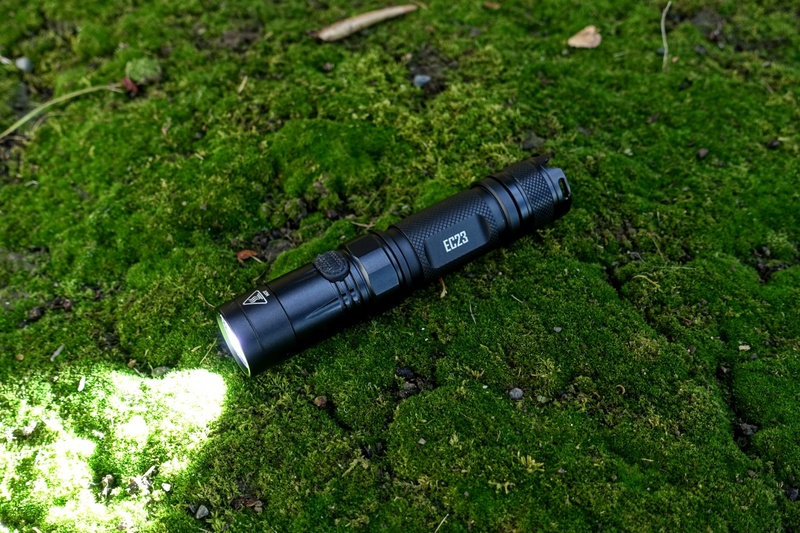 Nitecore’s new EC23 is a revamp of the previous EC20 featuring a brand new LED, which has almost double the output, and a new UI. If you are a fan of the simple look and feel of the EC20 but looking for the next generation of output, then say hello to the EC23! Overall, I love the output and I like the feel of the large tactile side switch over the metal one on Nitecore C1. I do like the turbo boost but it comes with some confusing quirks to the UI. 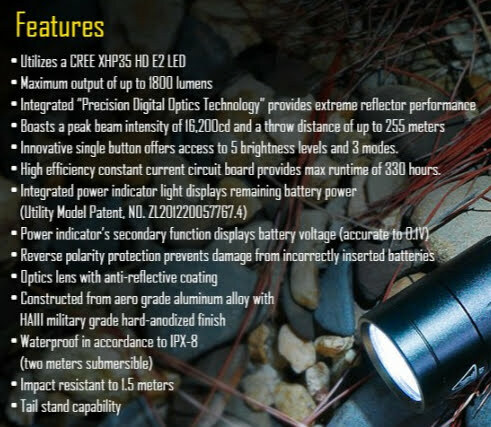 The total package feels a bit sparse (no pocket clip or holster) but this is probably the most budget friendly light 1×18650 in Nitecore’s current generation offerings. Also, you may need to buy a new high amperage battery to get the most out of the light. 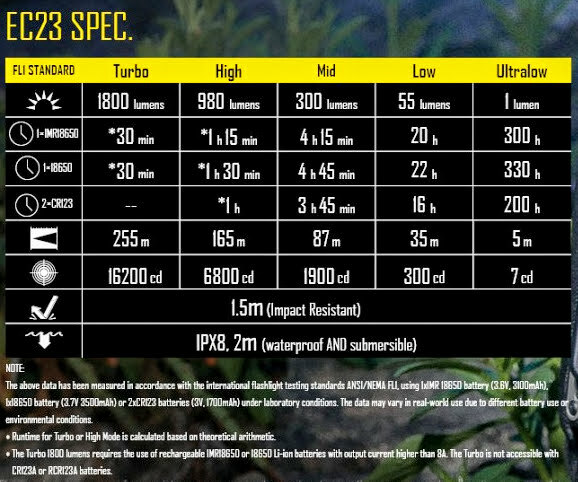 Here is the spec sheet from Nitecore’s EC23 product page. Note, to get TURBO you need a battery than can provide 8A. Overall, the whole kit is a bit sparse a pocket clip or a holster would have been a nice addition. Also, I’m a bit surprised that the box doesn’t display the entire FL-1 table for each mode. There is currently only one base model available and there are no kits or sets either. The body has a very inviting look and feel with a very smooth and shallower diamond knurling with an additional bit of hexagonal shape near the head for anti roll. I love the large tactile, silent, and back-light side switch as it’s very easy to find in the dark but does, understandably get pressed sometimes while carrying in a pocket. The light can tail stand nicely, and the tail cap even has a notch to let a pretty thick lanyard through (at least that’s the only explanation I can come up with) but I bet this could be configured a little better. Overall, I’m happy with the build quality. One of the satisfying parts for me is not having to push on the tail cap to bring the threads together, when using and IMR battery; I can set the cap on lightly and just screw it on. Other nice features are: gold-plated and a beefy spring, brass-looking anode, anodized and square cut threads, and a thick body tube. One thing to watch out for is that the head can loosen and loose contact. There seems to be a tiny little bit of rattling inside the head. Not much to speak of except the standard issue Nitecore wrist lanyard. The corona is a bit yellow/green with the edge of the spill having a purple color (possibly caused by the anti-reflective coating on the lens). Overall, not my favorite white-wall shots but but I kind of like the concept of a bit higher CRI in the center with a brighter feeling spill. Below is a comparison of the EC23 (left) with a Nichia 912B (CCT~5000K) in Nitecore’s MT06MD penlight (right). Overall the beam profile is a bit all over the place. Starting with the hot spot, standing back a few feet there is a dark spot right in the middle; the edge of the corona seems to get dimmer further away from the center but the spill afterwards looks brighter; finally, there is a tiny bit of a halo around the spill. Using a basic protractor I measured the beam angle coming out of the light to be about a 60° total spill with a 15° hot spot. Overall, I’ve been happy with the output mode spacing. Below are some pics from Ultra Low to Turbo. I’ve also included my beamshots youtube video which goes through each of the levels. White wall analysis is one thing but outdoors is another. Overall, what stands out is that I can still see the bit of purple spill. All the pictures below are taken with the light in TURBO. No battery is included with the off-the-shelf package; however, Nitecore did send me a 3100 mAh 35A IMR battery for testing purposes. Below is the battery options I pulled from the manual. It’s important to note that cells with 8A are needed to get TURBO. It’s also nice to see that IMR batteries are officially recommended. The length of the body tube can accommodate protected cells just fine. There are several power indicators but not explicit mention of built-in low voltage protection (LVP). You can always check the battery voltage from off by loosening and then tightening the tail cap and the voltage will blink out on the mode button (3.7v = 3 blinks, pause, 7 blinks). Once power reaches ~50%, the indicator light will blink once every two seconds; at ~10% power the indicator will blink repeatedly. TURBO is an instant burst which immediately decreases over a span of ~5min. The runtime on TURBO and HIGH are about 2h 30m and 2h 50m, respectively, with setting it and leaving it alone (no resetting of mode to try to regain the highest brightness). There is no PWM on any mode. The light appears to be temperature regulated with experiencing max temp of ~110°F (43°C). The constant strobe at ~18hz at and appears to be almost as bright as TURBO. I measured the light output in relative LUX and I have not spent time yet to calibrated for lumens or factored % of max output. The charts I’ve provided, while are literally quantitative, I suggest using as a qualitative reference for how the output may behave over time; typically lights aren’t left on this long and the max output can be reset. It’s worth to note that the runtime table provided by Nitecore states, “Runtime for TURBO [and] HIGH is calculated based on theoretical arithmetic.” so there isn’t physically reproducible in my tests. PWM check using a 50 millisecond test period with a sampling rate of 3,000 times per second. For special modes I used a 150 millisecond test. The TURBO has quite a spike in the beginning and immediately decreases over about 5 min. On HIGH I got about 2h 50m with just turning on the light and leaving it. There appears to be no significant PWM on any constant mode. I did measure a 18ms refresh cycle where the lx varies by about 50 but does not drop to zero lx on any but the U.LOW mode. Frequency is 1 flash every 2 seconds, with the flash lasting about 0.1 seconds. A max temp of 109.2°F was observed for TURBO. 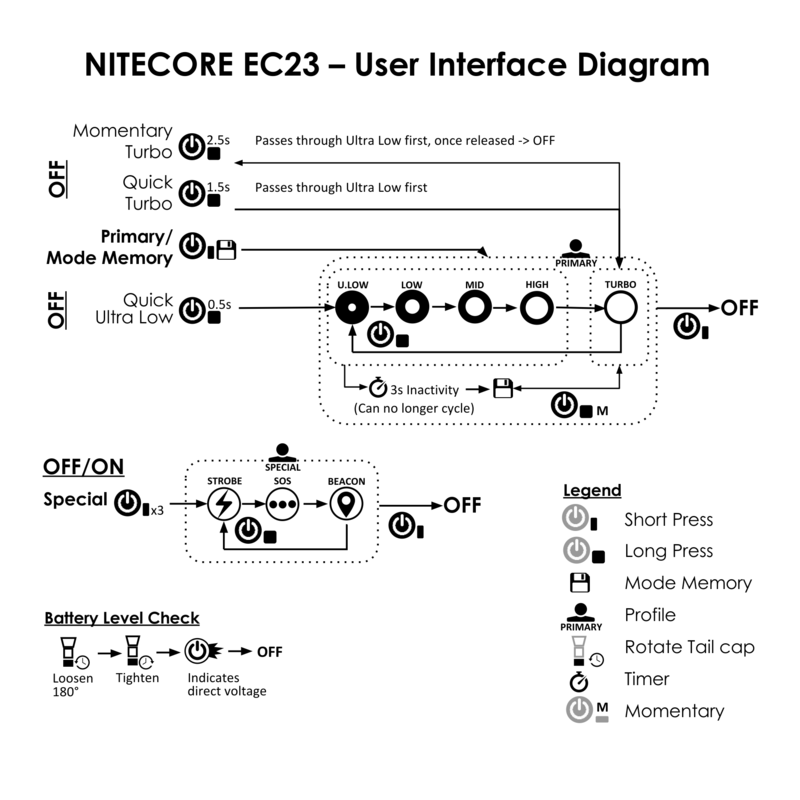 Usually Nitecore’s temperature “limiter” is set to 120°F but maybe they lowered it to 110°F, the manual doesn’t say. Overall, I’m not a fan of the UI because of the 3 second timer before the primary mode gets locked in. I like to constantly adjust my brightness based upon conditions; in order to adjust your primary output (after 3 seconds) you basically have to turn off the light and start again. I would have liked to see a double click be a shortcut to TURBO whether in ON or OFF, and a follow up double click would go back to the last memorized mode.